The appeal of this cake was immediate for me. Lemon desserts are a vice of mine (mainly lemon bars). With that in mind, a slightly heavier, less sweet dessert sounded just perfect. In fact, I hastily took the night off work this past Friday with the sole intent of making this cake. I haven’t been thinking of it terribly long, but when a recipe jumps out at you, sometimes you can’t wait to get started! I was so excited to get going, I accidentally added all the sugar to the butter and lemon zest. Bob just smirked when I asked if he would cream it by hand for me. It’s a difficult thing to do when the ratios are offset. Good thing he likes me! 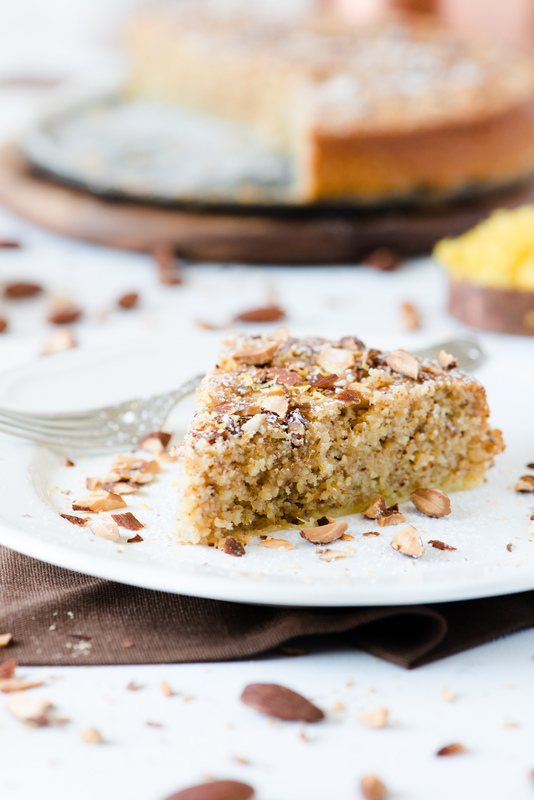 A simple, flourless cake, with flavours of almond and lemon. Line bottom of 8 inch cake pan with parchment paper. Combine butter, 165 grams of caster sugar, vanilla seeds, and lemon zest in a mixer, beating 8-10 minutes, or until pale & creamy. Scrape down sides of the bowl, adding egg yolks, one at a time while beating. Add almond meal, continue to beat until combined. In a clean bowl, beat egg whites, gradually combining the remaining sugar, and continuing to beat until soft peaks form. Add the beaten egg whites to the almond meal mixture in three parts, gently folding in. Pour cake mix into pan, bake for 45-60 minutes, or until firm to touch, and a toothpick can be cleanly removed from the center of the cake. Top with chopped almonds and icing sugar. Recipe courtesy of Cakelets and Doilies. 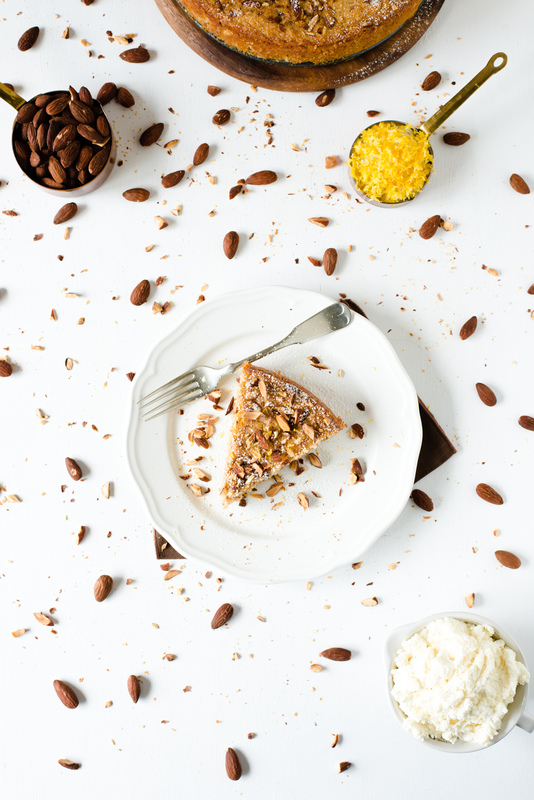 We worked side by side, making our own almond meal in our food processor, whipping up some egg whites, and trying not to get too excited and make another mistake. (Bob gently reminded me to read the whole recipe beforehand…) With all that behind us, we proceeded with the recipe, finishing by lightly pressing our batter into a spring form pan for easy release. Our cake was beautiful, though it took a small bit longer than the recommended 40-45 minutes at 325 Fahrenheit. It came out clean, with a glistening top, and great lemon almond scent. We couldn’t wait to dust it with confectioner’s sugar and dig in. Despite this, we waited for my good friend Mackenzie to stop by after work, and have a late night visit with us. It was well worth the wait! The first bites were unique to me, having never made a flourless cake, but the more I tasted, the more I loved it. The texture in particular, was enjoyable. 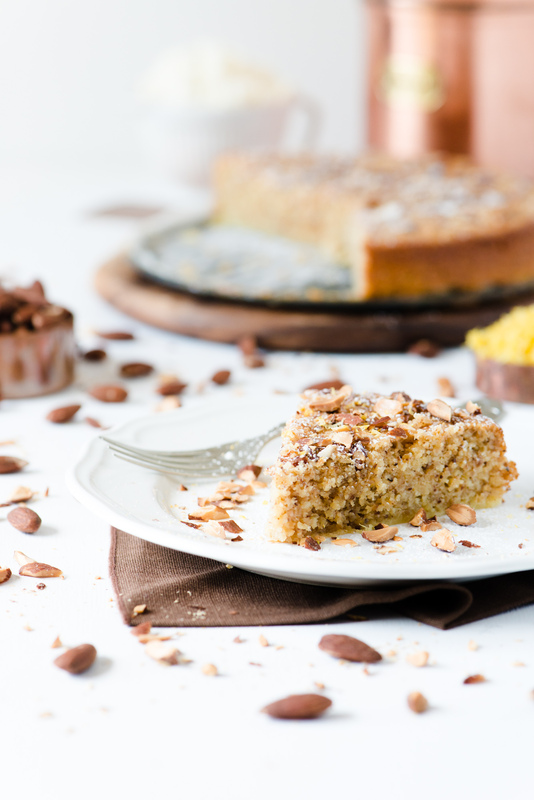 Ricotta and almond meal lend a little more substance to this dessert than floured cakes, and made us savour each bite. I would happily make this again, and of course won’t repeat my mistake of sugaring too much too soon!